Victoria Derby runner-up Stars Of Carrum (left) will return in the Manfred Stakes at Caulfield. A bigger, stronger and faster Stars Of Carrum makes his autumn return in the Manfred Stakes at Caulfield. The Victoria Derby runner-up is one of four horses trainer Robbie Laing entered for Saturday’s Group Three race for three-year-olds, but he will rely on Stars Of Carrum and Thorondor in the 1200m-sprint. 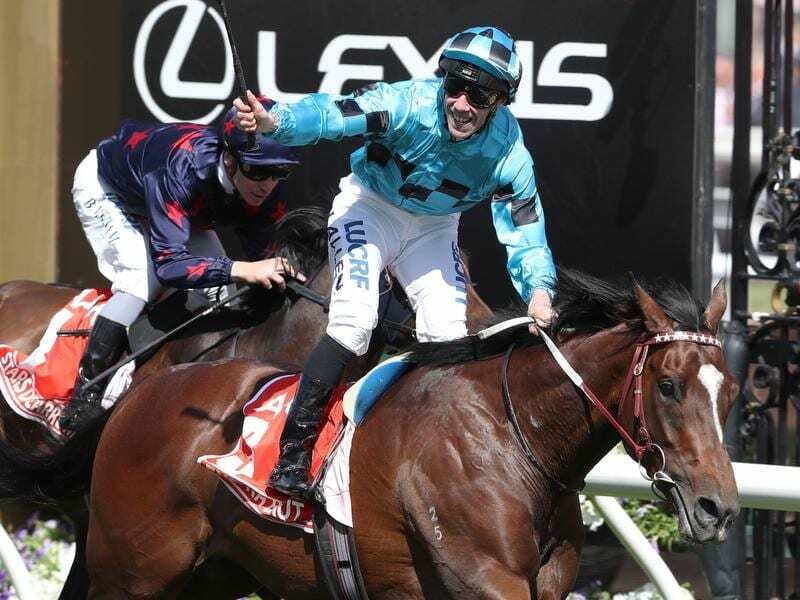 The Cranbourne-based Laing has mapped out a program to include the Australian Guineas, the Australian Cup and Australian Derby for Stars Of Carrum. “He’ll run Saturday then in the Colin Hayes, the Australian Guineas into the Australian Cup then he’ll have two in Sydney, the Rosehill Guineas and the Australian Derby,” Laing said. “He’s come back in great order, bigger, stronger and faster. “He galloped with Thorondor this morning and he would never have kept up six months ago but things have started to gel. Laing said the distance on Saturday would be too short but he expected to see the colt charging late. Stars Of Carrum hasn’t raced since finishing second to Extra Brut, also a nomination on Saturday, in the Derby which followed his victory in The Vase at Moonee Valley on October 27. Laing said Thorondor would strip fitter for his first-up sixth in the Inglis Dash at Flemington on January 19. He said the colt had been at his Cranbourne stable for a month after six weeks of pre-training. “We had a throw at the stumps in that (Dash) but he was a little bit underdone and it caught up with him late,” Laing said. “He looked the winner at the 200 metres but then he was out of chips with 100 to go. Laing will also saddle Missrock in the Listed W J Adams Stakes and says the mare is in great order after a gallop on Tuesday. “She flew this morning with Arrochar who also runs (benchmark 78) on Saturday,” Laing said. Laing said the Oakleigh Plate and Newmarket Handicap were possible targets for the mare as is a return to Adelaide in May for a another shot at the Goodwood, a race she has finished second in for the past two years.